Newton's cradle, named after Sir Isaac Newton, is a device that demonstrates conservation of momentum and energy via a series of swinging spheres. A typical Newton's cradle consists of a series of identically sized metal balls suspended in a metal frame so that they are just NOT touching each other at rest. Each ball is attached to the frame by two wires of equal length angled away from each other. This restricts the pendulums' movements to the same plane. currently, the simulation allows of exploration of n max = 7 masses with each mass m[i] that can be vary from the slider control from 1 to 5 kg. To move the balls, move the cursor over to the mass, click and hold the left mouse and drag the mouse to lift the masses. note that all masses are selectable and movable to a new height along the each path of the pendulums swing. select n =2 for a simple 2 ball system for the experiment. Pull and release one ball. Note the results and explain mathematically in terms of conservation of engergy and momentum. select n = 3 , 4, 5, 6, 7 and repeat the experiment above. Do the results meet your expectations? kinetic energies in = kinetic energies out. the clue lies in the conservation of momentum and kinetic energies just before and after collisions. Discuss what are the differences between this computer model and real life apparatus. hint: the newton's cradle motion will continue in this back and fro motion until all energies are lost to damping due to air resistance, friction, sound and vibrations. In this simulation the default is all balls have the same mass. What would occur if this was not the case? 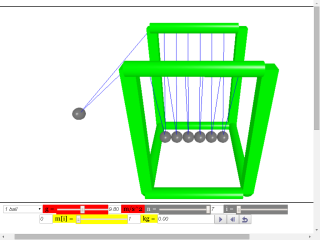 The Newton's Cradle Model was created by Fu-Kwun Hwang, customized by Loo Kang WEE, using the Easy Java Simulations (EJS) version 4.3.3.2 authoring and modeling tool. An applet version of this model is available on the NTNU website < http://www.phy.ntnu.edu.tw/ntnujava/index.php?topic=2195.0 >. You can examine and modify this compiled EJS model if you run the model (double click on the model's jar file), right-click within a plot, and select "Open EJS Model" from the pop-up menu. You must, of course, have EJS installed on your computer. Information about EJS is available at: <http://www.um.es/fem/Ejs/> and in the OSP comPADRE collection <http://www.compadre.org/OSP/>.